Our CSA members have had two of their weekly harvest boxes so far this season! One of the best, but also most daunting, aspects of getting a harvest box is being introduced to new and unfamiliar vegetables, or vegetables that you have a lot of and are not quite sure what to do with. One thing we definitely don’t want is for vegetables to waste away in the refridgerator, unused and unloved, and eventually composted (please, oh please, don’t put it in the garbage!). So here are a few of our favourite recipes for some of the either less familiar or highly plentiful vegetables. Remember, especially early in the season, vegetables are young and tender and flavourful, so keeping it simple is best. And when in doubt, just chop everything up and stir fry with your favourite sauce! Collard leaves are highly nutritious, but their size and unfamiliarity makes them one item that you may be tempted to let waste away in the fridge. We had this one for lunch last week on the farm, and it was very tasty. Mix in a few tasty vegetables and/or beans, such as small pieces of broccoli, garlic, onions, and stir fry in some oil. Season with salt, pepper, and fresh herbs, such as parsley, if available, or dried herbs and spices such as sage, basil. Cut out the thickest part of the stem. Depending on the size of the leaf, you may want to cut the leaf in half. 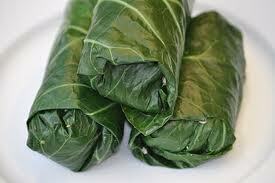 Steam collard leaves lightly, until soft but not falling apart. Using one collard leaf, take a spoonful or two of the inside mixture, place in the centre of the leaf, tuck in the sides and roll up, and place the roll on a platter. Serve wraps with a sauce of your choice. Some suggestions may include peanut sauce or glory bowl sauce. May be served hot or cold. 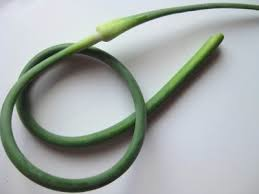 Garlic scapes are the flowering top of the garlic plant, and has a milder garlic flavour. Serve pesto on top of pasta, rice, salmon, chicken, in sandwiches, or anywhere else! A great way to add some flavour to any dish. While probably familiar from childhood, you may be wondering how to make this vegetable new and exciting. This recipe is one of my favourites. We’ll continue to post recipes for those difficult to use vegetables. Please feel free to comment with your favourite recipes, or requests for other recipes for certain veggies!